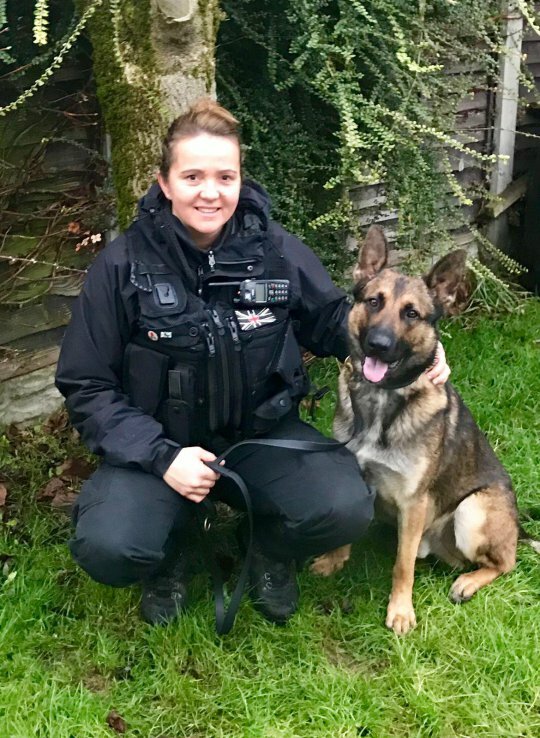 The overturned car was empty when PC Catherine Maunder-Green, PC Jennie Ellse, and Quantum the police dog arrived at the scene. 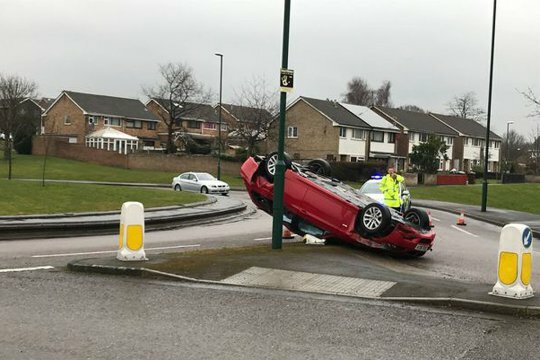 Dwain Claude West, 25, and Nathan Whyler, 29 had just gone on a violent rampage and crashed the stolen car in Top Valley, Nottinghamshire, on March 15. They were seen running away from the crash towards a local school, and the officers gave chase. The violence unfolded when Quantum found the men hiding in a bush nearby and they launched a viscous knife attack, slashing PC Ellse’s hand and stabbing PC Maunder-Green in the face. Quantum was brutally stabbed in the face as he tried to stop them escaping. He was left needing nine stitches to heal the wound. PC Maunder-Green, 40, was just a few months into the job at the time, and said: ‘I was trying to grab the man on the fence so he couldn’t get away and then all of a sudden he lashed out and I thought he had punched me in the nose. ‘I carried on trying to apprehend him and then he lashed out again and this time I felt a sharp pain and felt blood running down my face. That was the moment I realised he wasn’t punching me, he was stabbing me. ‘I suddenly had tunnel vision and my hearing went and all I could think was “I’ve been stabbed” and while I was thinking that he had gained a vital few seconds to get away. 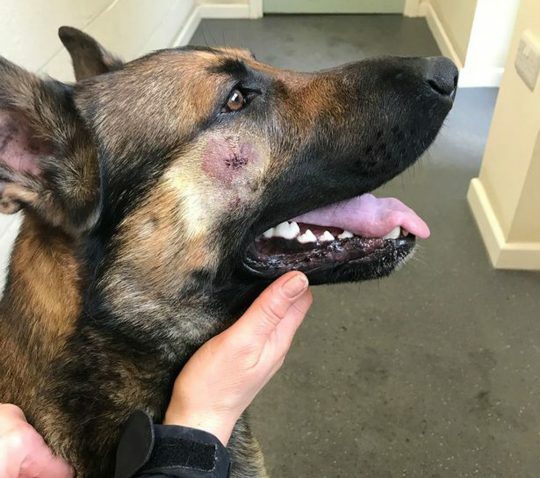 ‘I was able to catch the second man though who I arrested and the man who got away was arrested shortly afterwards.’ Dog handler PC Ellse, 42, who has been in the force for 16 years, said she will always remember the violent attack. She said: ‘While they were in the bush we tried to grab them and I saw one of the men go for Quantum’s face and I thought he was hitting him but then ‘I looked at the way his hand was shaped and I realised he was actually jabbing him with a knife. I am so glad Quantum is ok.
That could have so easily been Quantum eye.